Yesterday my Internet was out, and it’s spotty today, but some Wednesday I want to start doing “what I’m working on Wednesdays,” where I’ll show you what I’m working on and you can tell me what you’re knitting, too. What I am knitting, incidentally, is yet another pair of fingerless gloves. The Fiber Factor’s first challenge is to “knit your life,” which is pretty darn open to interpretation, an though I’m not really participating in the competition I thought it would be fun to think about what I might knit if someone asked me to make something representing my life. Ann from Mason Dixon Knitting got me thinking of actually trying to knit something in the time the contestants have, which meant I needed something small because my injury put me behind before I began. So it would be fingerless gloves. Mine are mostly in linen stitch, because I love it and it’s dramatic but easy (which is pretty much my whole knitting style). I’m using some yarn left over from my book that’s coming out in August, which is also my style. I’ll show them off next week. In the meantime, if you’re mad for fingerless gloves like I am, I’ve been piling up quite a collection of patterns to show you. The Dottie Mitts from Sneezerville are nice chunky mitts worked mostly in garter stitch with a cable running down the front and a bit of lace edging. 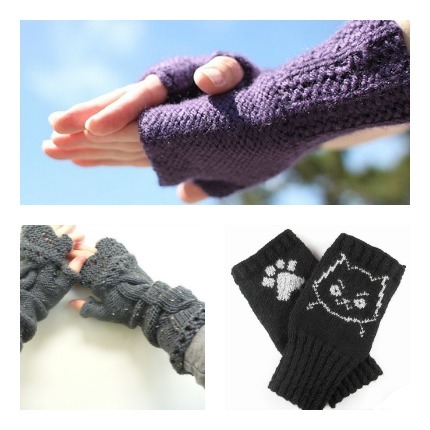 And there are two from Just Crafty Enough: Susi’s Cartridge Rib Fingerless Gloves, which use a ribbing with slip stitches and reverse stockinette for lots of texture; and Kat’s Cat Handwarmers, which have a kitty and a paw on them for extra cute. Ah, thanks Sarah. I am interested to see yours when they are done. I love doing fingerless mitts too. The fingerless glove effect can be moderated with a little due dilegence. This is a keeper! Good info! Thank you for the info Sarah.